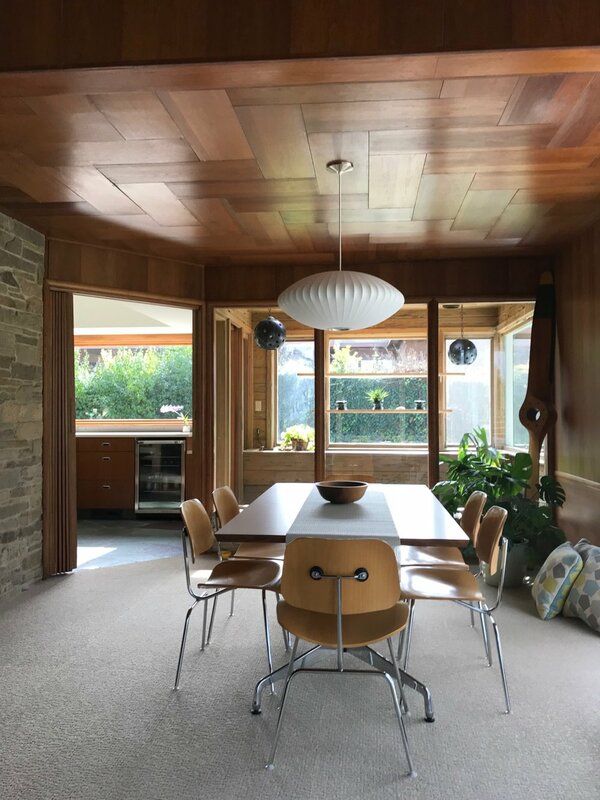 Julie Wolfert’s restored 1956 Alexander McColl-designed house is a rare example of the architect’s ranch style homes. It was completed around the same time that the interstate highway system was created, the nation’s first suburban shopping center was being built, television had become a household fixture, and Grand Rapids had begun expanding the city’s boundaries. The house is timeless, yet rooted in that context. McColl, a 1916 graduate of the University of Michigan, was a well-known Grand Rapids architect of English Tudor and historic revival styles. 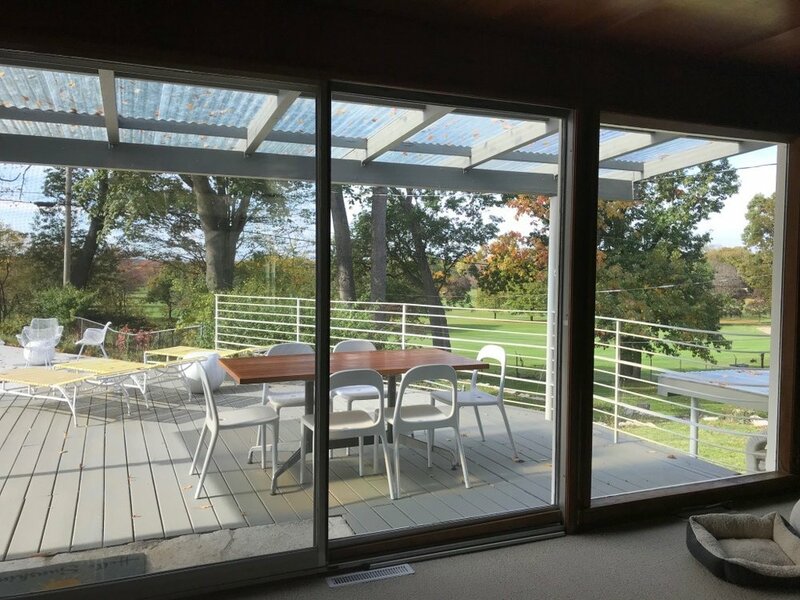 A few years earlier I interviewed the architect’s daughter, Ann Forslund. She told me about her father’s practice, and how he had always designed with the client’s wishes in mind, doing extensive research on the details of the requested style to add authenticity to the home’s design. 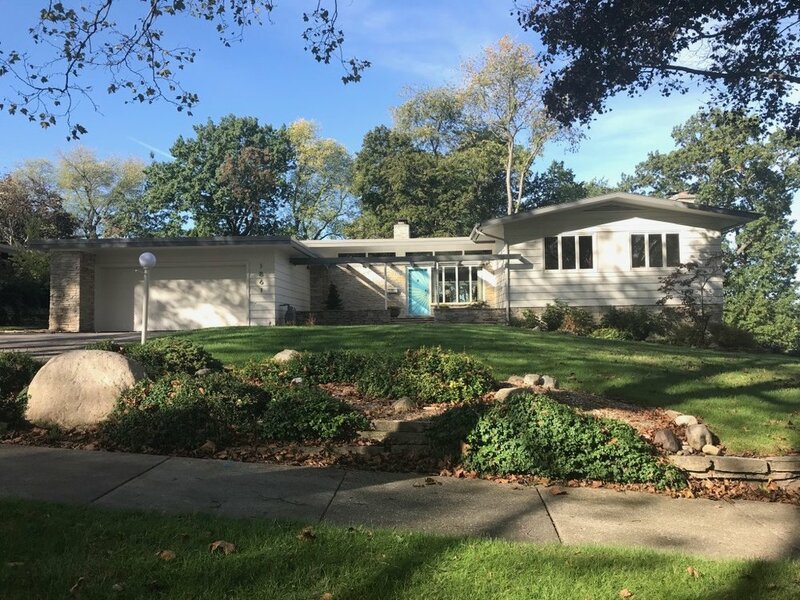 I have documented five Alexander McColl ranch homes in East Grand Rapids, one on the northwest side of town and two, including Julie’s house, on Meadowfield NE, a cul-de-sac street that was developed in the 1950’s by Jack and Fred Stiles. It overlooks Kent Country Club. After taking possession of her Meadowfield house in January 2017, Julie fast-tracked the restoration. She painted the original door and custom sunburst storm door a bright turquoise to add a splash of color to the light tan stone and frame exterior. 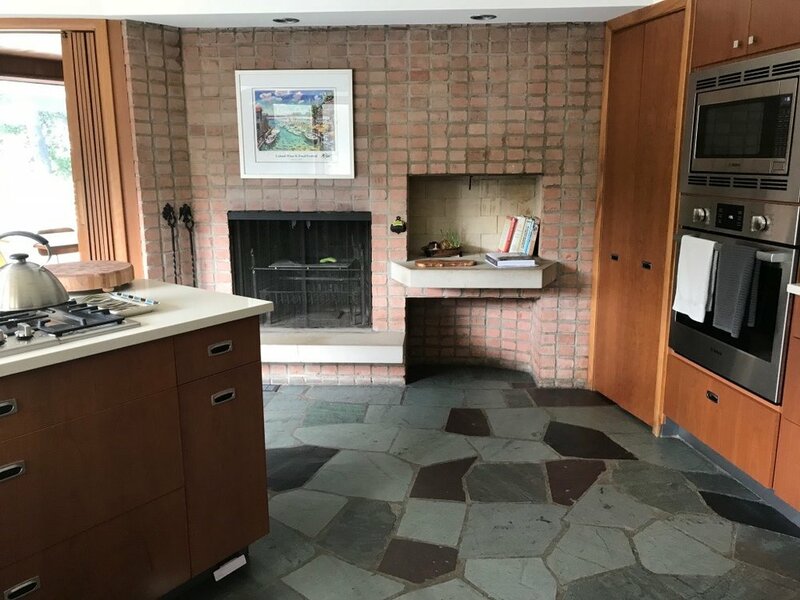 The foyer of this early open-concept house is tiled with colorful irregular slab slate flooring and decorated with a mid-century planter. Stone details recur throughout, as with the living room’s 10-foot high cut-stone fireplace wall with a raised concrete hearth. Rooms are wrapped in Mahogany, from wood-paneled walls to the living room’s parquet ceiling. Although the abundance of warm wood is something of a throwback to the beauty of Arts and Crafts houses, this home’s interior is thoroughly modern. 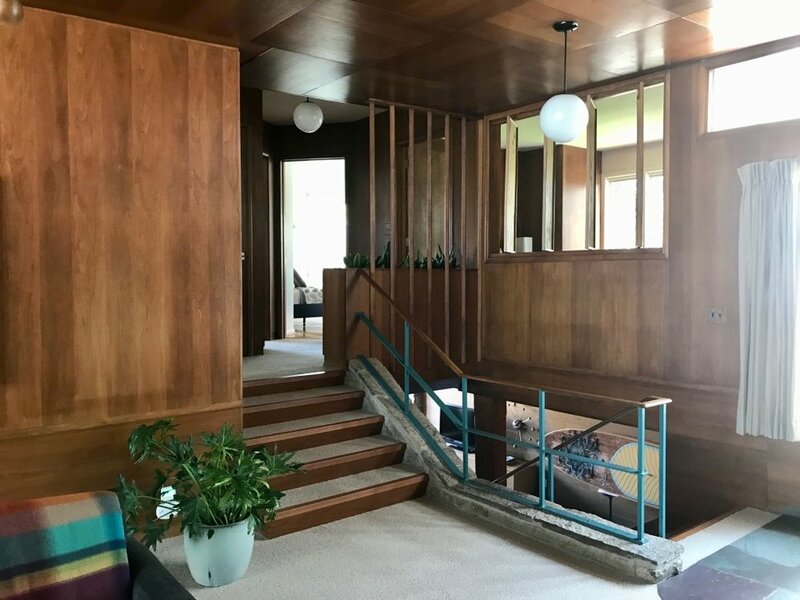 Mahogany paneling was a key interior design element of mid-century modern homes, notably in the iconic California Eichler homes. The Lazy L- shaped concrete pool with concrete apron was installed in 1975 by Spoelstra Pools. 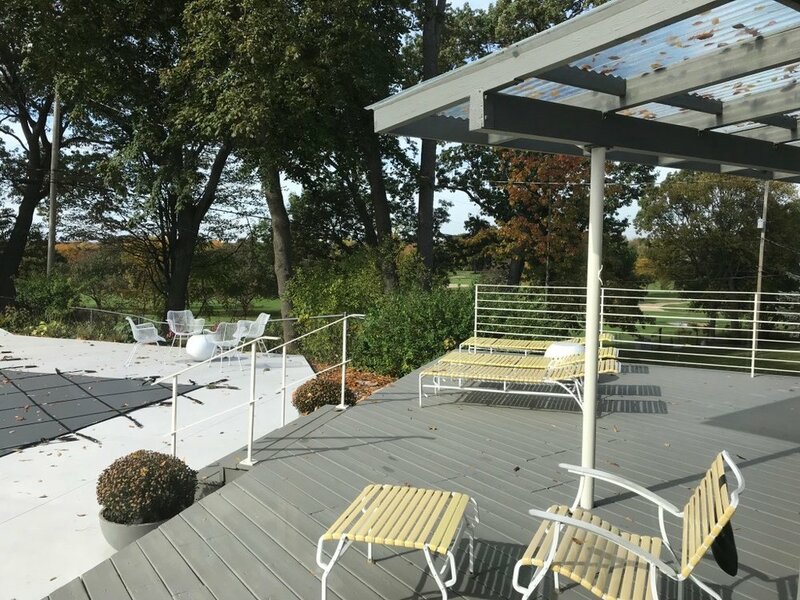 The day of our tour, the season’s autumn colors created a spectacular view of Kent Country Club’s rolling terrain, and Julie pointed out the golf club deer that had stopped at the fence to peer at us. Note the wood ceiling with a herringbone pattern. Back inside, the warmth of new cream-colored carpeting provides a soft balance to all of the cool finishes. 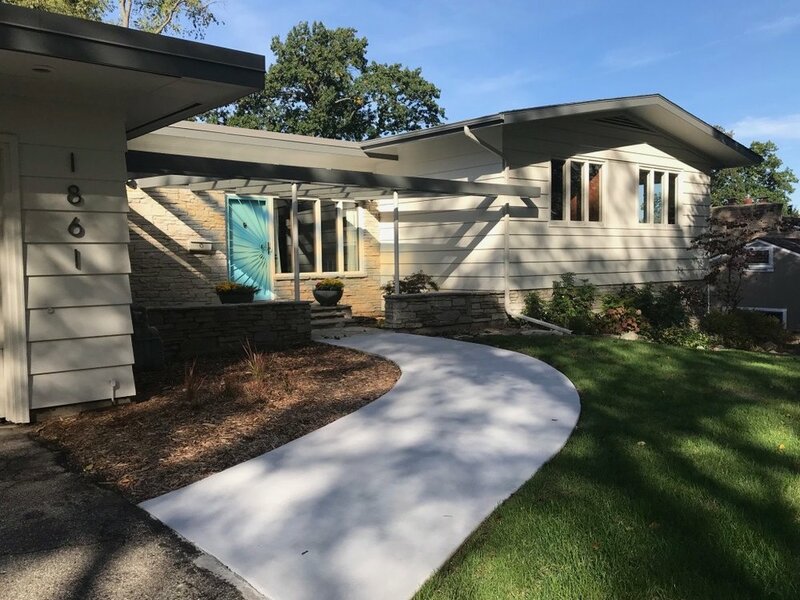 Mid-century modern design typically combines a variety of natural materials such as brick, stone, wood and glass, so that a la carte decoration is rarely necessary. 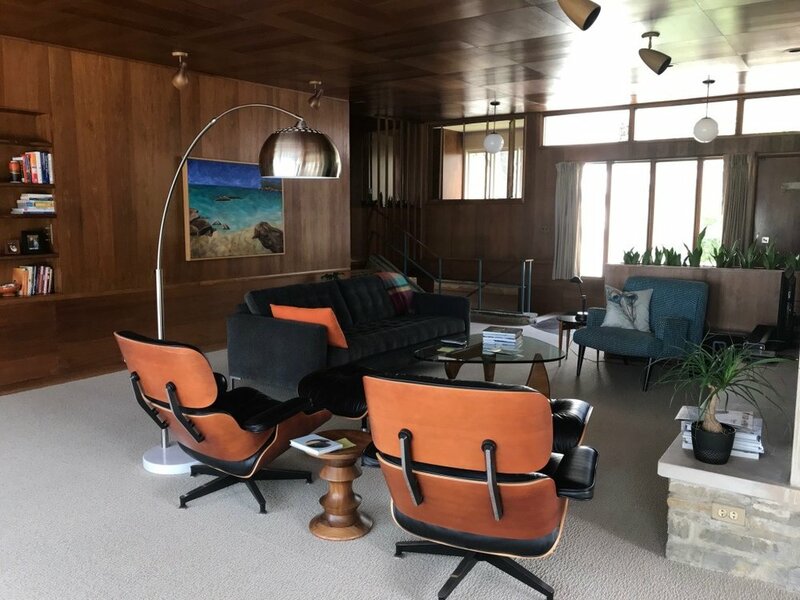 In keeping with the style, Julie has wisely furnished her home with iconic, modern pieces, including a pair of Eames lounge chairs, and a few rich-hued landscape paintings. The stone fireplace wall continues into the dining area, where the Mahogany ceiling now shifts into a herringbone pattern, illuminated by a saucer shaped George Nelson Bubble Lamp. From the greenhouse, Julie took us back through the living room to the open stairway. The turquoise metal railing is vintage but has a new custom wood bullnose and risers to match the original. We went up the half-flight to the second floor and the master bedroom where large windows showcase the best sunset views. We were curious about the small ramp next to the bed, and found out that Julie is developing the ramp for small dogs for injury prevention and mobility enhancement. She hopes to soon market this product as “Juan + Sofia,” the names of her former and current Chihuahuas. The adjacent dressing room and master bathroom retain their 1950’s powder blue sinks and tile, and the original pink and black tile has survived as well in the recently renovated guest bathroom. A half-flight of stairs down from the main floor is the family room and walkout level which is framed with hand-hewn beams, another stone fireplace wall, and a swath of original mural wallpaper. 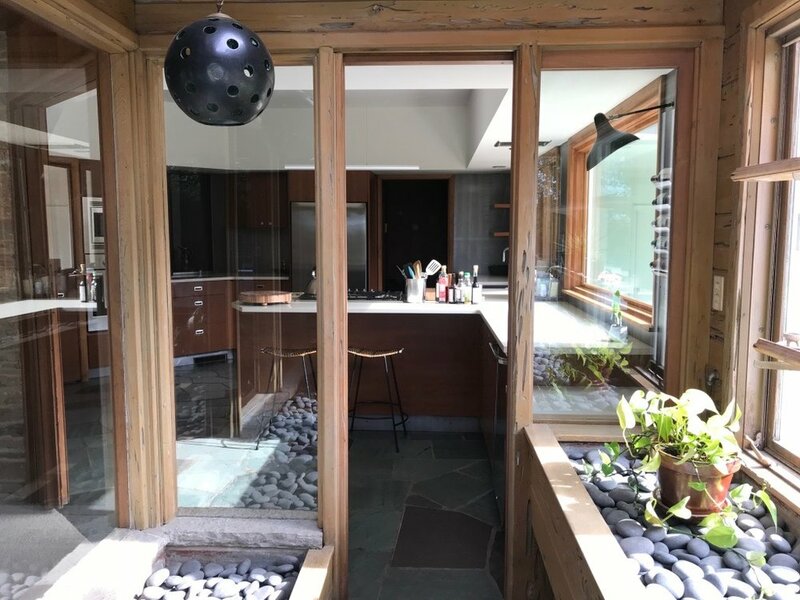 Julie mixed contemporary with mid-century by adding a minimalist stainless-steel back splash and a new wet-bar built within a former utility/water heater closet, both fabricated by Royal Sheet Metal. Julie installed a new tank-less water heater in the mechanical room of the basement. Current gym is located in the former specialty garage with triple doors to the outside. 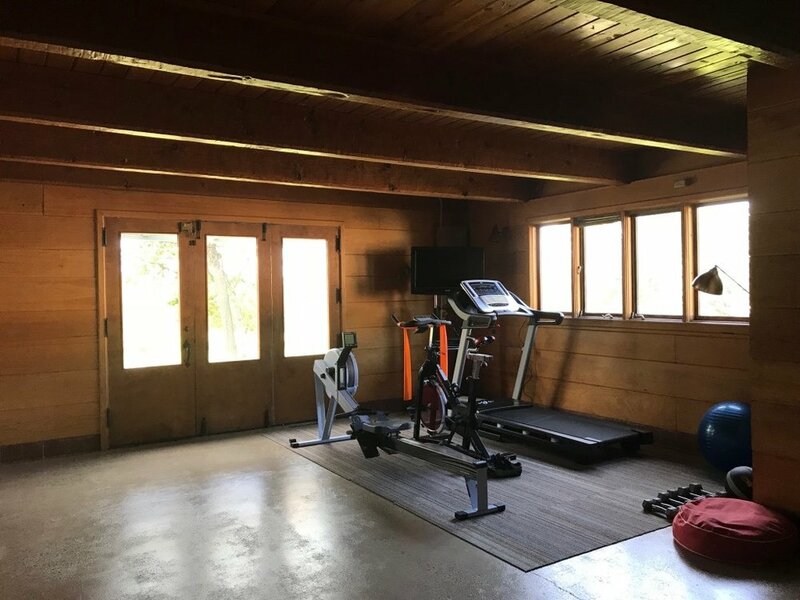 Also on the lower level, separately, is the gym and laundry room, complete with a beamed ceiling, more wood paneling, and triple doors leading to the backyard. The room started out as a deluxe “hobby” garage for the specialty car of the first owners, Elizabeth and Cornelius B. DeKorne. Cornelius DeKorne owned C.B. Cutting Tools on Ottawa near downtown. The DeKorne name has long been associated with furniture, and C.B.’s first career from 1916 to 1950 was working with his brother Lewis in the original DeKorne Furniture Store on Plainfield NE, now site of the Creston Brewing Company. C.B.’s father, Boudewang DeKorne, was a Dutch immigrant who carved sample furniture for the Berkey and Gay Company. Boudewang also did the moldings and cornice work in the lobby of the old Pantlind Hotel, now the Amway Grand Plaza Hotel. He did the same in the Stewart White house, later the Grand Rapids Furniture Museum and now part of Grand Rapids Community College. 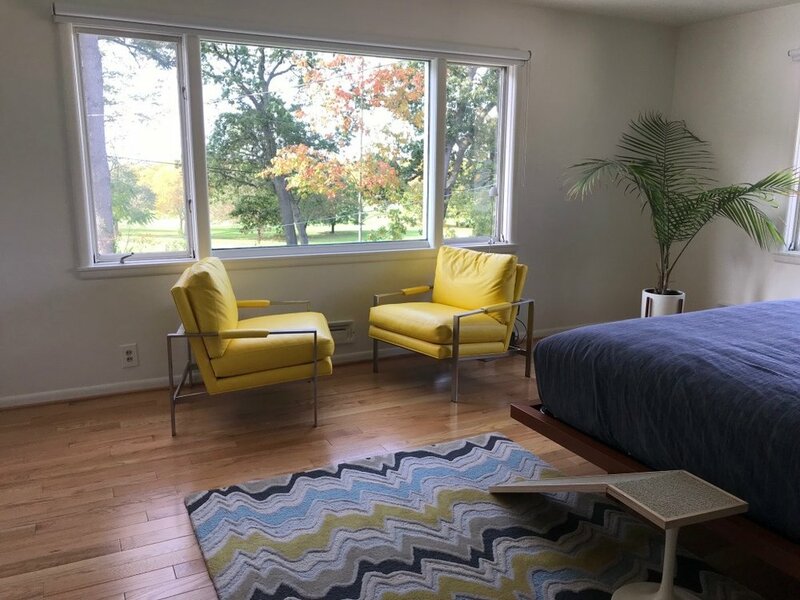 The Meadowfield house is a true mid-century gem brought back to life by Julie’s interior design experience and her commitment to faithful and tasteful renovation and restoration. Now she is taking her love of history and fine workmanship to an older historic period with a new project in the Heritage Hill Historic District.